Raman spectroscopy provides important information about materials. When laser light hit a sample, a small percentage of the scattered light may be shifted in frequency. The frequency shift of the Raman scattered light is directly related to the properties of the sample material. A Raman spectrum provides a “fingerprint” that is unique to the material. Raman spectroscopy is employed in many applications including mineralogy, pharmacology, corrosion studies, analysis of semiconductors and catalysts, in situ measurements on biological systems, and even single molecule detection. High sensitivity for some organic molecular structures bring Raman spectroscopy as very good analytical tool. Applications will continue to increase rapidly along with further improvements in the technology. 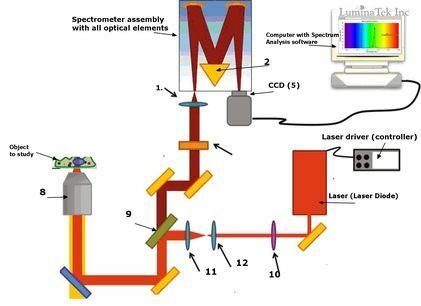 Here is the basic schematics of Raman Spectrometer. 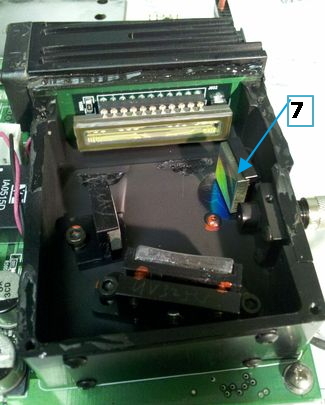 In this picture above the #1. is the optical input for CCD spectrum analyzer. #2 Is a prism and we can see in the real spectrum analyzer we use a parabolic mirror , which is shown in picture below with # 2 as well. Raman spectroscopy presents demanding requirements for the CCD detectors and resolution of narrow-bands of light with very low intensity and minimal frequency shift relative to the source. 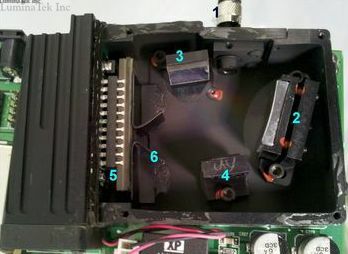 The CCD detector part is shown in the above schematics and the picture with #5. Detector is buffeled with buffle #6 to select only the specific spectrum and tune off the other signals. Look at this beautiful rainbow, reflected off the mirror 7, which is also shown as a part of Spectrometer assembly in the first drawing above. Very precise and good line controlled laser is an absolutely mast for Raman spectrometer. It is shown above in the diadram and as well as in the picture below, with number 11. As you can see Laser, beam splitter, spectrometer itself are interconnected with fiber optics and those fiber optics having little different characteristics. Red and Orange are not just the coloring on the output shroud, but distinguishing them from each other by optical characteristics. The beam splitter and the optical input module marked with #`12 is a complex optical part and the optical input of which is shown on the very first diagram with #8. Laser itself is very complex devise too. It has to be very stable and temperature independent performance. 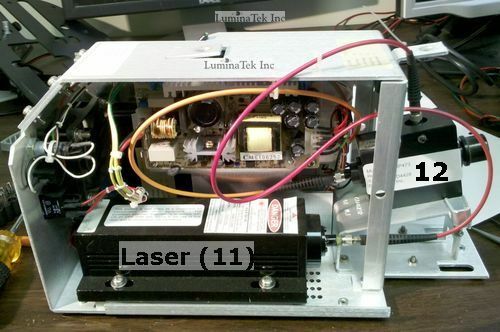 Under number 15 we see the Solid state laser and it is controlled very tightly with laser driver and by Peltie cooler underneath the laser die.